Manufacturer & Exporter of Brush Cutters & Electric Brush Cutter. 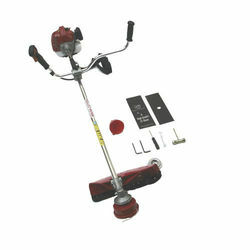 Our product range also comprises of Tractor Mower, Chain Saw and Electric Hedge Trimmer. We are dedicatedly engaged in offering a commendable range of Electric Brush Cutter that is provided with 33cc, 43cc & 50cc two stoke engines. It is used for various cutting and cropping applications in gardens and fields. Besides being manufactured from best-grade raw-material and advanced technology, the offered cutter is inspected properly by our expert professionals. Owing to attributes like durability and sturdiness, the offered cutter is exceptionally valued by our precious clients. The offered cutter is available with us in various sizes and shapes at affordable price. We offer a wide range of heavy duty professional Brush Cutter that are provided with 33cc, 43cc & 50cc two stoke engines. 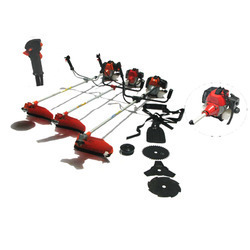 Further, these are also provided with all standard accessories and standard tool kit that includes Tool Kit, Nylon Cutter, 2T/3T Blade, Hanging Belt and User manual. These are used for various cutting and cropping applications in gardens and fields.